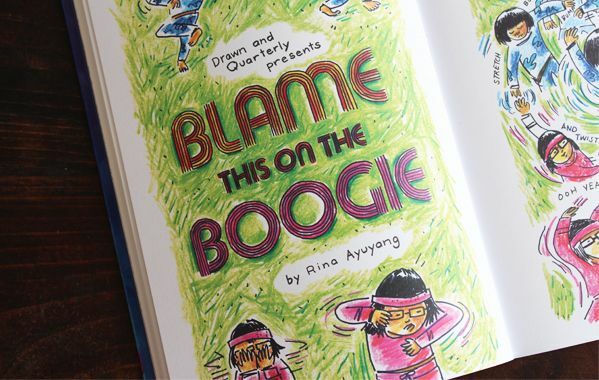 There are many things to love about Rina Ayuyang’s Blame This on the Boogie, but one that stands out to me is her waxy, crayon depiction of skin tone. In her first autobiographical comic, Ayuyang captures snippets from her life growing up as one of few Filipino Americans in Pittsburgh, Pennsylvania to the struggles of motherhood and postpartum depression in sunny California. Drawing from the vibrant colors of Hollywood musical cinema and flashy television, Ayuyang crafts a beautifully scrappy look into a unique and relatable (for me at least) Asian-American experience. But back to the art for a second. Asian-American graphic novelists have been the rise, American Born Chinese by Gene Luen Yang from 2006 was the first graphic novel by an Asian American I read and fell in love with. More recently, I was thrilled to read and witness the success of Thi Bui’s graphic memoir, The Best We Could Do. Both illustrators present clean story-lines with equally distinct coloring and lines. Blame This on the Boogie provides an entirely different approach. Ayuyang’s stories bleed into one another, with no clean panels to guide the reader, and her colors are pure and stacked. It is a strong and well-executed choice that echoes her love of dance and sport. As a darker-skinned Viet boy, I grew up avoiding the brown crayon, reserving it for trees and ground, but Ayuyang artful layerings of yellow, red, orange, and brown all help lend the full range of tone and dimensions to her depictions of herself, her family, and the racial diversity of an American experience. Cheers to that. Fayeza Hasanat’s debut short story collection, The Bird Catcher and Other Stories, is set in the Bangladesh and the United States. It is filled with questions about identity and belonging, about those who are seeking answers under the weight of expectations–their own or otherwise. A favorite discusses a talkative grandmother who wrestles with the idea of home, herself an immigrant, residing with her children in the U.S. Several others turn on gender dynamics, and those who are between genders or missing some traditional aspect associated with proscribed roles for men and women. Many take dark turns, faced with life on the edge. Hasanat’s writing is a bit flowery to my taste, but her concepts are intriguing and her characters vulnerable, and their experiences of feeling out of place honest. Original airdate October 20, 2018. Marvin and Honey ask Louis and Jessica to be their baby’s godparents. Jessica eagerly agrees, mostly so Marvin and Honey can have a date night, leaving the Huangs to babysit on Halloween night, and shutting down Louis’s efforts to persuade Jessica to dress in a couples costume with him. Jessica and Louis are alarmed to discover that they aren’t the naturally talented parents they thought. Their claim that Eddie was weaned from the pacifier with no problems is a deception by Louis; their claim that Emery’s weaning was even easier is a deception by Jessica. Eddie gets a job selling mattresses (his boss is played by George Wendt) and works Halloween night to prove he has what it takes. Trent comes by to help, but he’s much more of a hindrance. Evan and Emery, dressed as Dana Scully and Fox Mulder, get to hand out candy at the front door, where they have a problem with a girl who shows up repeatedly, each time in a different costume. Another silly but mildly entertaining Halloween episode. The costumes are great, and it’s nice to see the continued development of Eddie’s character (in two separate plots!). There’s a moment at the end of the teaser where Louis gives his dejected face. That face is some excellent Randall Park acting. My favorite costume in the episode is Grandma as Freddy Krueger. Despite this being a really meh episode, the tag at the end is completely unexpected, perfectly in character (which is a brilliant paradox), terrific character development for Eddie, and genuinely sweet. Sweet Eddie is the best! Eddie made Evan! Lines I enjoyed: “Alf was a puppet?” (Jessica). “You love black dresses and putting words into my mouth” (Louis). “Not being wise is being dumb. You make me dumb” (Jessica). “Damn you, perfect Evan!” (Louis). Trevor Larcom as Trent was, last season, regularly the best actor among the young men who play Eddie’s friends. He has an off episode here, and it may not be his fault. Trent’s part in this episode is idiotic. Hudson Yang as Eddie feels pretty off as well, although he has a few good moments in the mattress store. All three plots feel like something out of the sitcom plot handbook. Soundtrack flashback: “The Rose” by Bette Midler (1979) and the theme from The X-Files by Mark Snow. That never takes a chance: The wonderful final few seconds of the episode give it a boost, but not much of a boost. B-. Original airdate October 12, 2018. I’m feelin’ all right: There’s something endearing about Jessica’s not knowing how to deal with (or talk about) the failure of her novel, A Case of a Knife to the Brain. She seems humbled in a way she’s completely unprepared to understand, and rather than lash out or muscle her will into being, she wanders. I love this Jessica, and Constance Wu does some wonderful acting in the scene where Honey calls her out. I also will not complain about any Honey-heavy episode that’s not baby-centric. Eddie-Emery partnerships are almost always interesting, and Louis going too far while being focused on someone else is one of the best Louises. Some lines I enjoyed: “I sleep on her failure every night” (Grandma). “There’s no such thing as quality time. There’s just time” (Jessica). Gonna let it all hang out: I have no real complaints about this episode. Even Marvin is charming (especially when he says he’s hit his pre-baby weight: before Nicole, who’s 18). But this is the second episode of the season, so it’s apparent that there is no Roseanne joke coming. Come on, FOtB writers. The door is wide open for a very funny joke about Roseanne Connor throwing the Huangs under the boat and then finding herself written out of existence. It doesn’t have to be cruel; it can just be pointed. FOB moment: I learned something about sitting the month. There’s also something cultural in “There’s no such thing as quality time; there’s just time,” right? Soundtrack flashback: “Man! I Feel Like a Woman” by Shania Twain (1997). Final grade, this episode: An altogether pleasant episode that doesn’t distinguish itself from the rest of the utterly competent episodes making up most of the corpus. B. Airs tonight, October 5, 2018 at 8:00. It’s the end of summer, 1998 in Fresh Off the Boat time, and it’s time for Honey to have her child, and it’s time for Marvin to give up his sports car, and it’s time for Jessica’s novel A Case of a Knife to the Brain to finally see its release. Nicole and Eddie have some Saturn Time: Nicole’s got some big news for her best friend. The official summary from ABC gives more details than I would, so skip this paragraph if you’re very sensitive about spoilers. While Honey and Marvin celebrate the birth of their baby, Jessica’s book is finally released, and she’s optimistically looking forward to a book store reading that’s been set up by her publisher to help boost sales. Louis is so excited to promote the book across the country that he buys an RV from Los Angeles Lakers great Kareem Abdul-Jabbar, who owns an RV dealership which is managed by underappreciated Calvin (Jaleel White, “Family Matters”). Meanwhile, Emery and Evan are concerned about Eddie after Nicole tells him that she’s moving to New York, and he seems completely unfazed about losing his best friend. It feels like the show is slipping into its groove. All the characters feel familiar, and there’s even a celebrity cameo in the RV sales lot across the street from Shaq Motors. It has a few surprises and laugh-aloud moments, and everyone looks great. Especially Jessica. I’ll comment on a couple of disappointments in my review of episode 2 next week. Part of the plot is suspect. People line up for a certain novel published in the U.S. on September 1, 1998, but I don’t think it was quite the phenomenon its successors were in following years. Soundtrack flashback: “Everywhere You Look” by Jesse Frederick, the opening theme for Full House. “Back in the Day” by Ahmad (1994). My grade for this episode: B.